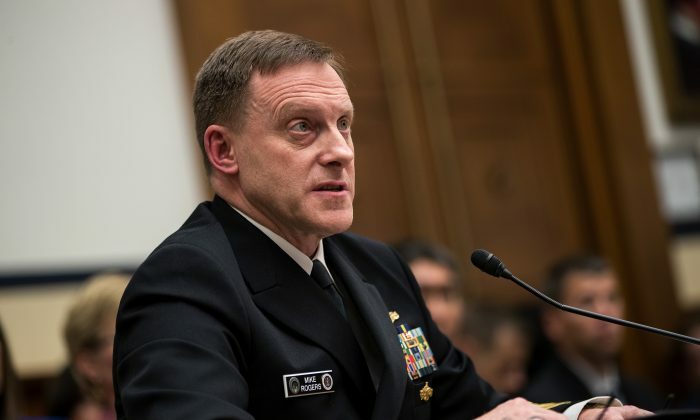 The U.S. Cyber Command is now on an equal plane with other combat branches of the U.S. military, and plans are underway to potentially separate it from the National Security Agency (NSA). The command works on Pentagon activities that include cyberspace, with a view of the internet as a domain for warfighting, similar to land, sea, air, and space. President Donald Trump elevated the military force, also known as CYBERCOM, to the status of a unified combatant command, in a memorandum on Aug. 18. This places the combat command on the same level as other commands including Central Command, Southern Command, and Africa Command. Trump said the new designation will “strengthen our cyberspace operations and create more opportunities to improve our nation’s defense.” He also said it “demonstrates our increased resolve” against threats in cyberspace, deterring adversaries and reassuring U.S. allies and partners. The move will create a single commander to run the operations of CYBERCOM, which Trump said would help “streamline” the command and control of time-sensitive cyberspace operations. “Elevation will also ensure that critical cyberspace operations are adequately funded,” he stated. The move will create a single commander to run the operations of CYBERCOM, which Trump said would help ‘streamline’ the command and control of timesensitive cyberspace operations. At the same time, the U.S. Secretary of Defense James Mattis is “examining the possibility” of separating CYBERCOM from the NSA. Former President Barack Obama was required to establish a unified combatant command for cyber operations forces, under the National Defense Authorization Act for Fiscal Year 2017, which he signed on Dec. 23, 2016. The act signed by Obama also prohibited the secretary of defense from ending the “dual-hat” arrangement, under which the commander of CYBERCOM also serves as director of the NSA. This requirement holds unless the secretary and chairman of the Joint Chiefs of Staff both certify that ending the dual-hat requirement will not lower the military effectiveness of CYBERCOM. However, in a statement at the time of the signing, Obama said he was in favor of the ending the dual-hat arrangement. “I strongly support elevating CYBERCOM to a unified combatant command and ending the dual-hat arrangement for NSA and CYBERCOM,” Obama said, adding that his administration communicated this position to the incoming Trump administration. Trump announced in the Aug. 18 memorandum that he had consulted with the secretary of defense and the chairman of the Joint Chiefs of Staff on the elevation of CYBERCOM as a unified combatant command. Mattis and Director of National Intelligence Dan Coats are expected to provide Trump with a recommendation and a plan for the future relationship between CYBERCOM and the NSA.